Big Data is a collection of large and complex data, which are quite impractical to handle with traditional software tools and systems. 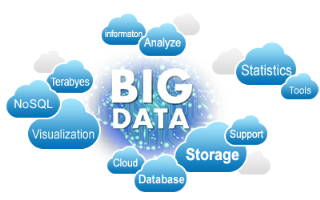 Besides, Big Data also refers to technologies and initiatives that efficiently manage and run the system. Further, Big Data isn’t just numbers, dates and strings, but also includes audio, video, unstructured text, geospatial data, log files etc. Why is Big Data Important for Business? All kinds of businesses generate data these days. If a company runs a travel agency, healthcare service or even a single ownership enterprise it has data and has information about its customers, its user experience and more. This means companies of all sizes need a strategy for big data and a plan of how to collect, use, and protect it. Not just collection, Big Data will be very useful for enterprises to save money, grow revenue, and achieve many other business goals, in any kinds of vertical. Big data might allow a company to collect billions of real-time data, information and points on its products, resources, or customers and then repackage them instantaneously to optimize customer experience or resource utilization. For example, retailers can collect the data like user web clicks which can be useful to identify behavioral trends that improve delivery, campaigns, pricing and stock. Utilities based on Big Data can capture household energy usage levels to predict outages and to invent more efficient energy consumption. With various technologies and services related to Big Data, understanding individual business requirements and generating revenue based on the model, can be challenging. Interactively explore crores of data in just a few seconds. Visually examine data and structures quickly. Look at both structured and unstructured data and discover when and why your customers' behavior changes and providing efficient solutions to handle or benefit from such behaviour. Assemble powerful analytics for the company. Simple and easy-to-use analytics can greatly help even those with limited technical skills to interact with and analyze data on their own. Share the results and other findings through the web, smart phones or any other applications.